Born September 9, 1957, Ken Volk has spent most of his birthdays working the harvest in vineyards and wineries. Son of Kenneth and Bette Volk of San Marino, California, Ken Volk is a third generation Californian. In his youth, he was at home in the family's gardens and orchards. He was a high school track star in sprints and relays, and an avid fisherman. After graduation in 1975 from San Marino High School, he attended the University of Arizona, only to return to California to complete his AA degree at Orange Coast College. In the summer of 1977, Volk transferred to Cal Poly State University at San Luis Obispo to pursue a degree in Fruit Science. At the time, he imagined his future in a greenhouse or orchard. By chance, his student berry enterprise project was situated downhill from the campus vineyard. Trading responsibilities with a vineyard student, he was rewarded with Gamay grapes and made his first wine with a trash can and a baseball bat. He was hooked. The experience gave him some important insights with respect to fruit science. With winegrapes, what would otherwise be highly perishable fruit can be transformed into something intensely interesting and complex. It not only fails to spoil, but actually has the potential to increase in value over time. He also noticed that it tastes really good. After that first experience with winemaking, Ken read all the wine and viticultural publications he could get his hands on. He took numerous enology classes at the U.C. Davis extension program; technical classes at the wine lab in St. Helena, and graduated from the now defunct Napa School of Cellaring. As his skill and zeal for winemaking grew, his home winemaking production quickly took over the garage of his Cayucos home. Ken's first professional winemaking experience was at nearby Edna Valley Vineyard, working "the crush," as harvest is known in the winegrape industry. The following year he convinced his family to back his plans for developing a vineyard. He searched the Central Coast for an ideal location, looking as far south as Santa Barbara and as far north as Santa Cruz. "At the time, this part of the world was not taken seriously for fine wine production," recalled Ken. "But looking at some of the wines being produced at Chalone, Edna Valley Vineyard and Estrella River Winery (now Meridian Vineyards), I knew that wines from the Central Coast could compete with wines from any California region or anywhere else in the world." In 1981, Ken and the Volk family established Wild Horse Vineyard and constructed Wild Horse Winery. Over the next twenty-two years, production grew from 600 to 150,000 cases. In 2003, he sold Wild Horse Winery & Vineyards to Peak Wines International, a division of Jim Beam Brands Worldwide. In December of 2004, Ken purchased the "Original" Byron Winery facility from the Robert Mondavi Corporation and renamed the property Kenneth Volk Vineyards. In 2006 the first wines were released. 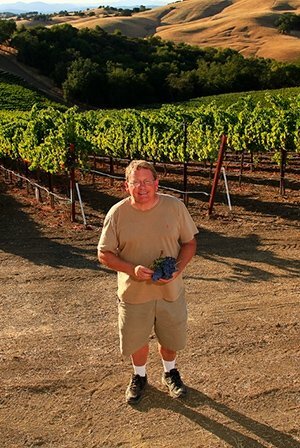 Ken Volk has served the community well over his 25 years in the wine industry. In 1982, he was the founding President of the Paso Robles Grape Growers Association. In 1986, he served as Vice President of the Central Coast Wine Growers Association. He has served as Chairman of the Board of the Paso Robles Vintners and Growers Association (1998-2001) and was part of the founding Board of World of Pinot Noir. Volk currently serves as a founding Board member and Chair of the Cal Poly-San Luis Obispo Enology, Wine Marketing and Viticulture Advisory Council and as Secretary of the Board of the Santa Barbara County Vintners Association. Ken and Tricia Volk reside in San Luis Obispo with their children, Kenny and Valentina. Prior to joining the KVV team as Enologist in 2014, Romag worked harvests in New Zealand, Sonoma and Paso Robles. 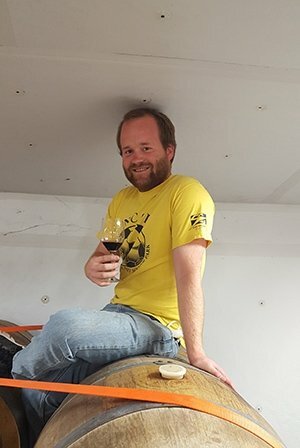 He was Assistant Vintage Winemaker at Mudhouse and Astrolab in Blenheim, NZ. David brings a wealth of knowledge and experience to KVV, having worked several harvests in California and New Zealand. His interests and experience also include the sales and hospitality side of the wine business. Like Ken Volk, Romag earned a Bachelor of Science degree in Fruit Science from California Polytechnic State University.